Most people think family cemeteries, particularly ones in the western United States, consist of a couple of tumbledown marble or wooden headstones surrounded by a rotting picket fence. Sad to say, this is mostly true: but there are exceptions. Take for example the family plot of the McMillins, in Roche Harbor. John McMillin owned the local lime works and was active in local and state politics. He believed he owed much of his success to his religion, personal philosophy and family, and wanted to express this through the construction of a tomb that was full of symbology that would be rich to him and to others. The meaning of much of the tomb’s symbology has faded, but visitors can find several places in Roche Harbor that have maps to the tomb and pamphlets explaining the design and purpose of the magnificent structure. 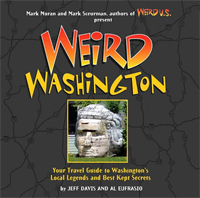 The mausoleum is located near Friday Harbor, and can be found by following a trail leading through the local cemetery. The trail leads through a green, overgrown wood, a sign reading, “Afterglow Vista” marks the entrance. After going through the gates, visitors must walk up three flights of stairs. The steps symbolize many things, especially to Freemasons. The first flight has three steps, which represent the three ages of man. The second flight of stairs has five steps, which represent both the five orders of classic architecture and the five senses. The last flight of seven steps represents the seven liberal arts and sciences and also symbolizes the seven days of the week. Once up the stairs, visitors reach a raised platform, on which several pillars support a domed roof. In ancient times, pillars lined the western entrance to any house of worship. At Afterglow, one of the western pillars was installed broken to symbolize the way death breaks the column of any man’s life. The dome has a central opening, supported by Maltese arches between the columns. 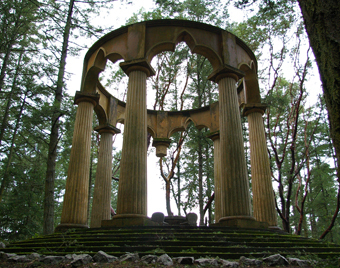 Originally, McMillin planned to have a bronze top placed over the opening, but the family left it open to nature. Rather than landscaping around it, they left the entire structure, including the family crypt on the platform, open to the elements. 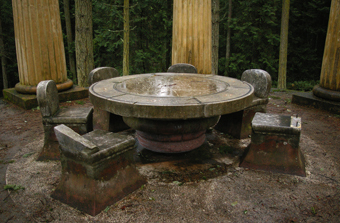 Perhaps the most striking feature of Afterglow is the large, limestone table on the platform, which symbolizes the entire McMillin family meeting in unity over dinner. Around the table are chairs for each family member, with the corresponding names written on the chair backs. A hollow niche inside each seat serves as the place in which the family member’s cremated ashes rests. Besides the family, one other person is buried here: Ada Beane. She was McMillin’s personal secretary and more like family than an employee. After she died, she was cremated and the family kept her ashes, which were later interred in the family crypt. Unfortunately, vandals turn up even in remote places like Roche Harbor. A few years ago, they attacked the McMillin crypt, damaging one chair back and removing another completely. Even so, the place still has a peaceful aura. As the sun goes down on summer evenings, the lights shine through the trees on the tomb. Some people believe that when it does, somehow the shadows change, and the McMillin family meets again to have a ghostly dinner together in the afterglow.